I got screened at age 65 as part of an annual check-up. During the colonoscopy they found one polyp and removed it. The tests showed that it was benign. I go back for a follow-up in ten years. In the meantime, I’m trying to get more fiber in my diet, and I’m encouraging others to see their doctors and get screened too. 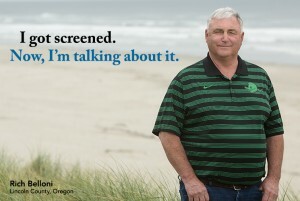 It’s painless, it’s easy to do, and it can help with the early diagnosis and prevention of cancer. You’ll be glad you did it–for yourself and your family.